We offer European glass tubes and rods made of borosilicate glass. The tubes can be exposed to high temperatures. Additionally the chemical resistance is also high. Applications are pipeline constructions, heat exchanger, flow meter, boiling accessories, luminaire and lamp protection covers. In addition to borosilicate glass we also offer Quartz glass tubing and rod. 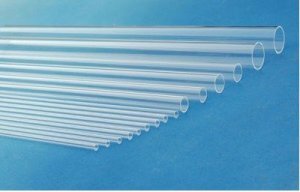 Borosilicate tubing is also used as a Sight glass in chemical storage vessels and in industry where a visual check is required. Mining, Chemical. Scientific, Medical, Education for schools and Universities.